According to ChemOrbis, initial June PE prices are emerging across Europe after the monthly ethylene contracts settled up €60/ton from May towards the end of last week. Sellers are aiming for hikes larger than the upstream gains for another month, pointing to the tightness which remains in place following new production outages. Following Ineos’ force majeure declaration on HDPE from Lavera, France, SABIC declared force majeure on LDPE from Wilton, the UK following a shutdown in the second half of May. The plant has an LDPE capacity of 400,000 tons/year. Repsol also declared force majeure on HDPE from Sines, Portugal due to technical issues at the end of last week. The plant at Sines has a capacity of 150,000 tons/year. In Germany, a distributor lifted his West European PE prices by €100/ton for June, commenting, “It’s too early to understand whether we’ll manage to achieve such hikes for another month, but supply is still very short.” Another distributor raised his June PE prices by €100/ton for LDPE and by €110-120/ton for HDPE and LLDPE from last month. “Supply is tight, especially for HDPE and LLDPE. Despite overheated prices, we expect buying interest to be good as most converters are holding low stocks,” he said. 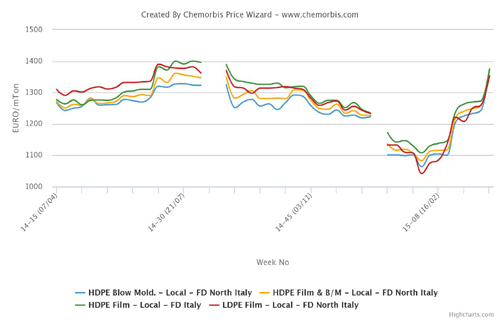 A distributor in Italy expressed his June sell ideas with increases of €100/ton for HDPE due to tight supply while the seller is aiming for slightly smaller hikes of €80/ton for LDPE given better availability. According to the seller, availability is particularly tight for LLDPE. A cable manufacturer received initial June PE offers from his South European supplier with hikes of €100/ton from May, according to ChemOrbis. Another converter expressed his June buy ideas up €80/ton from last month and commented that he expects to pay larger increases than the ethylene hike due to persistently tight supply.